Some Friends pictured outside the Friends Meeting House. L to R: John W. Sturgeon , Cecil J. Lane, Mrs Olga K. Gully (Clerk) and Martin K. Mail The new Meeting House built in the grounds of Friends’ School. Lisburn Meeting House, Prospect House, 4 Magheralave Road, Lisburn. Elders: Joseph J Kennedy, Cecil J. Lane and Martin K. Mail. Meeting for Worship Sundays at 11.00 am. The Friends burial ground, which was in use from 1774 to 1899, is located behind a high wall in Railway Street, beside the old Meeting House, which is now a listed building. This picture shows the high wall and entrance to the Friends burial ground in Railway Street. All Quakers Gravestones have a uniformity of size and simplicity, name, age and date merely recorded. Pictured above is the gravestone of John Gough, first headmaster of Friends School. The Religious Society of Friends, commonly known as Quakers, came into existence in 1652 in Cumbria, North West England, through the vision of George Fox (1624-1691) who was concerned about the disparity between Christian profession and daily life. Hypocrisy, corruption and inconsistency in 17th Century Church life caused many to seek a better way. Fox challenged the clergy believing Christians were not divided into two classes - spiritual and temporal. Many early Friends suffered persecution and were imprisoned as they refused to take oaths or pay tithes to the Church. The story of Quakers in Lisburn began as early as 1655 through the influence of an ex Cromwellian soldier called William Edmundson who had settled in Lurgan. At a cattle fair, he bought three cows from John Shaw of Broad Oak, near Lisnagarvey, and Shaw declared after the deal was completed, “Edmundson’s words and deportment were a means to convince me of the truth.” Thus John Shaw his wife and family became convinced that the simple Christianity expressed by Quakers was what they sought and they gathered a few together at their home Broad Oak and held the first Quaker meeting in the area. It was possibly near Blaris or maybe at Portmore. George Gregson was a merchant who lived and had his business on the corner of Market Square and Jackson’s Lane, now Railway Street. In a large garden behind his home he built the first Friends Meeting House, a simple thatched building. Access was by a narrow lane from Market Square. Friends worshipped there for many years, and the building even survived the great fire of Lisburn on 20th April 1707, as it lay on the leeward side. In 1793, a new much larger Meeting House was built on the same site, with an entrance onto Jackson’s Lane, now Railway Street. Such was the growth of Quakerism in the first half of the 19th century that an even larger Meeting House was built in 1853, fronting on to Railway Street. An adjacent burial ground, which is now hidden behind a high wall, remained in use from the 1700s until the early 1900s. In keeping with Quaker simplicity each gravestone is uniform in size and design, bearing only the name, age, and date, to avoid any differential between rich and poor members. 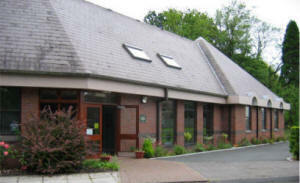 Lisburn Friends sold the building in Railway Street in 1995 and since the 5th October 1996 have occupied a new Meeting House built on land at Prospect Hill, Magheralave Road, adjoining the new Preparatory Department of Friends School. The school was originally built by Quakers in 1774 for the education of their children; however, today pupils come from the different traditions representing the wider community of Lisburn. 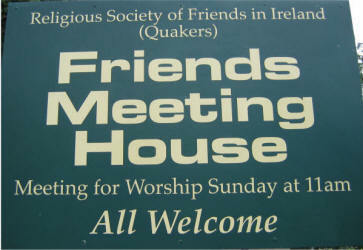 A Friends Meeting for Worship is based on silence, from which develops a shared ministry, “the priesthood of all believers.” There is no programme, and anyone led by the Holy Spirit may offer vocal ministry, a prayer, or a reading, some teaching, often speaking from personal spiritual experience - a theme tends to connect each contribution. Friends meet in simple surroundings with no symbolism, they gather to know one another in that which is eternal, they believe in the Inner Light “This was the true light that enlightens every person by his coming into the world” John 1.9. They believe all men are equal in the sight of God and have no hierarchy. A strong room in the Meeting House contains records of Friends in Ulster going back to 1675. These records are also on microfilm at the Public Records Office, Belfast.